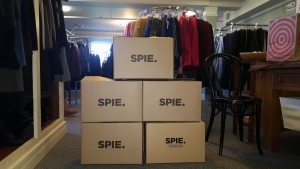 SPIE Clothing Drive – Thank you! Thank you, SPIE, for organizing a clothing drive for our Back to Work Boutique! Thanks to your generous donations, women in need in our community will continue to be able to visit our Boutique and gain free clothing and accessories. GO SPIE!